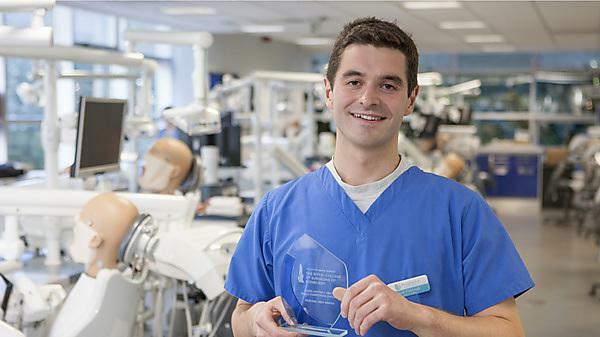 Jack Colcough, a dental student at Plymouth University Peninsula School of Dentistry, has won the first round of the Dental Skills Competition 2015. Run by the Royal College of Surgeons of Edinburgh, the competition sees final year dental students from across Britain demonstrate their skills in a series of challenges. The competition begins with 16 heats, one at each UK dental school, during which the students are asked to undertake complex dental work on a mouth mould, which is then anonymously submitted to the assessors. Along with a certificate and trophy, Jack was awarded a travel and accommodation package to compete in the Grand Final in Edinburgh on 10 March 2016. At the grand final the top 16 finalists from across the UK will be tasked to undertake a broad range of clinical procedures before determining who will be the overall winner. Joint second prize in Plymouth was awarded to Romana Linkova and Zoe Harding.